Sometimes the road to get great photographs gets a little bumpy, no I mean literally physically bang your head on the roof of the car bumpy. The drive up to the Race Track starts out with a nice scenic drive thru the middle of Death Valley, and I mean hot dry brown dessert brush with mountains on both sides of you. The signs as you leave Furnace Creek warn you that you better make sure you have plenty of gas that cost $5.60 a gallon in the park (it was two dollars cheaper outside the park). When you make it to Ubehebe crater you are at the halfway point and you have to stop to see an impressive natural example of mother nature's force in Death Valley. The crater is over a half-mile across and over 500 feet deep. Magma pushed close to the valley's surface and super heated water that exploded. When you walk around the crater it is an odd sensation, as the explosion pulverized the rock into tiny gray pebbles and you feel like you are on a pebble sand dune. Now the fun starts. I was told we had it easy, as they had just re-graded the road three weeks ago. You could not prove that by my ride up. It was 27 miles of bone jarring road, watching out for sharp rock that had rolled back into the dirt road. Did I forget to mention that it is also a single lane road, so you had to watch out for cars and trucks coming down the opposite way? Jeff, my buddy and co-founder of “The Digital Photo Workshops,” was the mad man driving the four wheel drive high clearance vehicle. Jeff likes to drive fast - I mean really fast and he has concocted a reason to drive obsessively fast on a dirt road. He told us that it wouldn’t feel as bumpy; I beg to differ with him on this point. To say the least it was a white-knuckle ride up that road for an HOUR. I have to admit it was worth taking my life in my hands with Jeff’s driving. 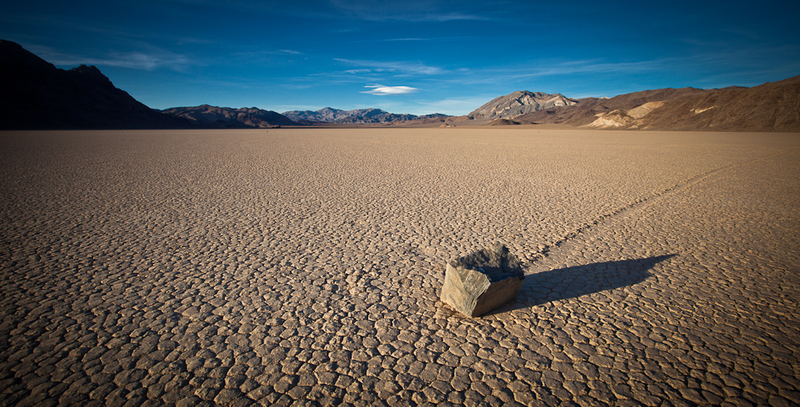 The shots we got were great and I have finally photographed the moving rock at the Race Track in Death Valley. Here are some images from that shoot and a video of that drive.